“Charles Dibdin was born in Southampton on March 15, 1745, the eighteenth son of a poor silvermaker. Before his death in 1814 he became one of the most celebrated songwriters in Britain. Although his music is not currently highly regarded, the patriotism and sentiment embodied in his songs reflect his times at least as well as history books. Dibdin began to sing at the Cathedral, at concerts during races in the area and became the principal performer in a weekly amateur concert. Rather than continuing studies for a career in the church, Dibdin determined to make a career in music. Dibdin had the good fortune to be introduced to the manager of Covent Garden, and Dibdin was hired as a chorus-singer. Recognizing his talent, the manager hired Dibdin to compose THE SHEPHERD'S ARTIFICE in 1762. Dibdin was seventeen. For a time he both composed and performed in ballad operas. He had great success as a performer, but he stopped performing in order to devote himself to composition, thereafter singing only in public performances of his own music. Although his opera LOVE IN THE CITY (1767) failed, his music had been praised, and Dibdin began to make a name for himself. His greatest early success was THE PADLOCK (1768). For several years he produced music for local theatres. In 1778 Dibdin was appointed the exclusive composer for Covent Garden at a salary of 10 pounds per week. However, his relations with managers and performers were poor, and the scandal of his liaison with one of the chorus singers caused a great deal of turmoil. According to his account he was the victim of ‘ill-treatment and breach of faith’. Dibdin left Covent Garden and became one of several parties to build the Circus Theatre (later the Surrey Theatre). Dibdin was appointed sole manager for life and was to be paid one fourth of the profits. However, personal conflicts again arose and Dibdin withdrew from the Surrey in 1785. He then entered a period of financial turbulence. Dibdin financed the building of a theatre, which was destroyed by a wind storm. He turned his hand to writing and began a weekly periodical, THE DEVIL, which failed. Destitute, Dibdin sold the rights to his music. He sold THE WATERMAN, which had made two hundred pounds, for two guineas. He wrote music and performed Entertainments named the Whim of the Moment, Poor Jack, The Oddities and others. In addition to the income for performing, Dibdin sold the music to publishers. By his own account he made more money in four months than he had in his whole life. Charles Dibdin's life was marked by scandal. During his first marriage he had a liaison with Mrs. Davenet, a chorus singer at Covent Garden. He had children by her, including dramatists Thomas and Charles, both of whom eventually took their father's name. Dibdin abandoned Mrs. Davenet, leaving her in poverty. According to one source his abandonment of her was the reason he lost his position at Covent Garden, as Garrick took her part. He left Mrs. Davenet for Miss Wyld, whom he married upon the death of his wife. Charles Dibdin is best known for his nautical songs. This is in spite of the fact that he was at sea only for one brief voyage and did not appear to have ‘extended contact with seafaring people’. Dibdin idealized sailors and wrote of them as noble heroes with faithful sweethearts and wives, who often died bravely in the cause of their country. They are sentiments that now seem overly romanticized, but that were extraordinarily popular with the public and the men he wrote about. “This recording reunites Gilbert and Sullivan expert Simon Butteriss (baritone) with the excellent accompanist Stephen Higgins (fortepiano), fresh from the success of their work on Retrospect Opera’s previous release, F.C. Burnand and Edward Solomon’s PICKWICK and George Grossmith’s CUPS & SAUCERS. 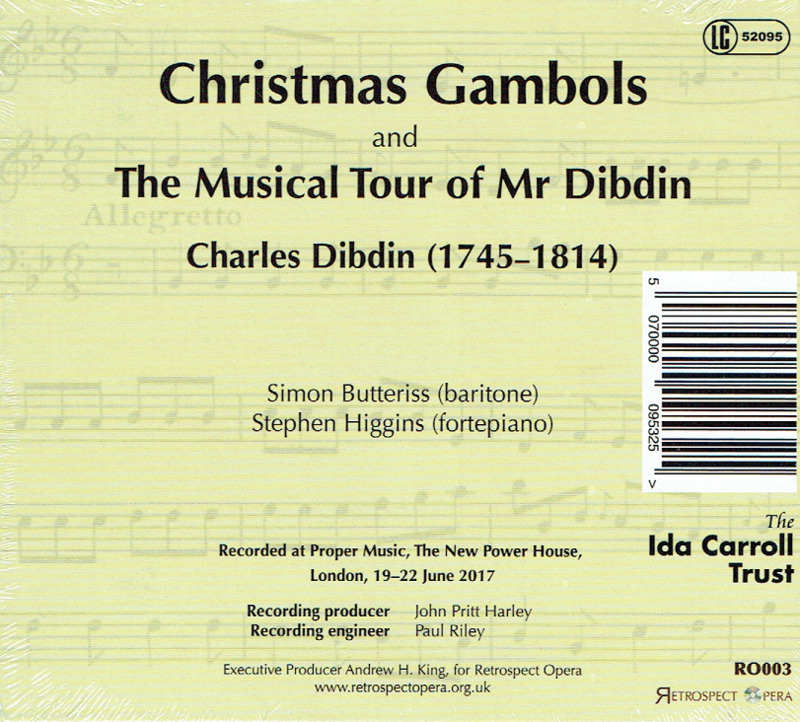 Composer and librettist Charles Dibdin was the most significant writer of English comic opera and song in the late 1700s, and the leading singer-songwriter of his age, highly respected as a versatile performer on the London stage. In 1787, he presented the first of his ‘Table Entertainments’, one-man musical shows in which he performed songs at the piano as part of a dramatised story. Over the course of the next two decades or so, he wrote hundreds of songs. While many of these ‘Table Entertainments’ are sadly now lost to history, CHRISTMAS GAMBOLS (1795) has survived more or less intact. Intended specifically as a Christmas show, it is the fullest picture of an eighteenth-century Christmas to have come down to us. It is replete with reference to festive traditions of the time, and features charming and engaging songs in a range of different styles guaranteed to put the listener in the spirit of the season! 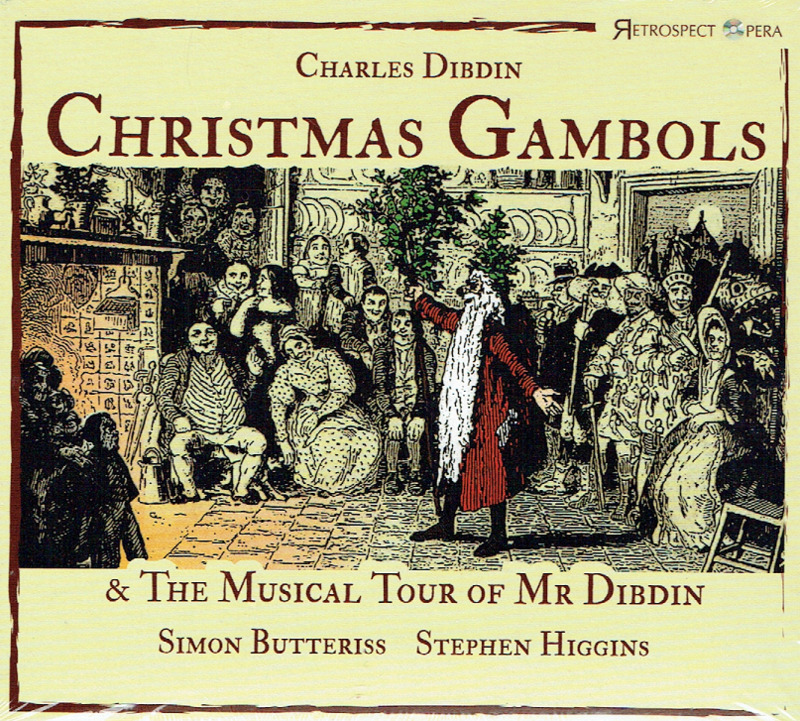 It is paired on this recording with THE MUSICAL TOUR OF MR DIBDIN, a bravura combination of some of Dibdin’s most famous songs with extracts from another of his ‘Table Entertainments’, specially compiled for this release by baritone Simon Butteriss himself. Retrospect Opera, founded in 2014, records works that represent the heritage of British opera from the 18th, 19th, and early 20th centuries. It brings together top performers and researchers to create recordings of exceptional quality, beautifully presented, with highly informative booklet notes. Its vision results in releases of the highest standards of great British operas that enthusiasts may only have read about.